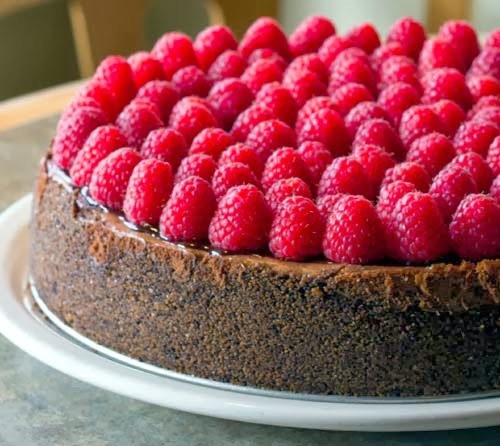 This recipe is simply a dark chocolate cheesecake recipe garnished with raspberries. Two online sources are used to make this fantastic treat -- 1) www.cheesecakeislove.com for the crust and ganache and 2) Kraft website for the filling. It's fruity good! Using a food processor, crumble the Graham Crackers and Oreo cookies. Add salt and sugar. Pulse the processor until there are no more big chunks. In a small bowl, blend cocoa powder with 1 teaspoon of water until fully mixed. Add to food processor and continue to pulse. Then add melted butter and keep pulsing. Crust batter should be clumpy and not mushy. In a 9-in springform pan, press the crust batter throughout the bottom and about 1/3 up the sides. Bake in oven for 7 minutes, then set aside to cool. Chop up the chocolate and place in a small mixing bowl. Slowly heat the heavy whipping cream in a small sauce pan until it just starts to boil around the edges. Immediately remove from heat and pour over the chocolate. Allow to sit for 5 minutes, and then thoroughly combine using a fork. Add the salt, dark corn syrup, and Grand Marnier, and thoroughly combine until smooth and a single color throughout. Pour mixture evenly over cheesecake. Quickly tilt cheesecake by hand to fill in any spots along the edge of the pan. Note that because cheesecake is cold, mixture will harden quickly. Once the ganache is cooled, place cheesecake back in refrigerator. Before serving, garnish cheesecake with raspberries. Enjoy!